PVClay is manufactured in the Brazilian state of Rio Grande do Sul, which is the southernmost state in Brazil. The owner of the company, Edinho Juliotti, is also the manufacturer and distributor of PVClay, so this is truly a small company that you can feel good about supporting. PVClay makes a full range of polymer clay that comes in 2 ounce (56 gram) bars in 42 colors, this is called the “Decor” line. There is also a range of doll and sculpture clay that comes in 1 pound (456 gram) blocks in gray, translucent, and flesh tones and this is called the “Sculpture” line. You can find these on the website at www.pvclay.com.br as well as a flexible blade, gloss varnish, and liquid polymer clay. By the way, the site is in Portuguese, but you can select English at the top of the page. Also, the name for this material in Portuguese is Cerâmica Plastica, which translates to plastic ceramic. 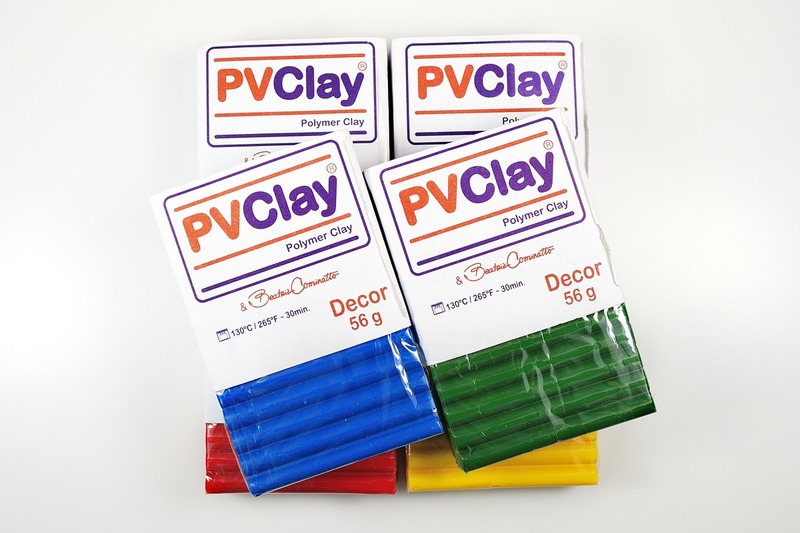 PVClay comes in 2 ounce bars just like most other brands of polymer clay. The bars are wrapped around the middle with thin cellophane (open on the ends) and that bar is then placed into a paper sleeve. The color and lot information is placed on the side of the sleeve with a sticker. This polymer clay is not sealed air-tight. Since the ends of the bar are only protected by the paper sleeve, dust and particles collect on the ends of the clay bar. Make sure you remove them by wiping with a damp cloth or baby wipe. PVClay feels firm to the touch and I did fear that it was going to be too firm to condition. My normal way of conditioning polyclay is to cut slices from a block and run them through the pasta machine. This clay, however, looks a bit strange when you slice it. Instead of having a uniform texture, slices of PVClay appear sort of…well…chunky. And I was disappointed to find that the slices immediately crumbled into tiny bits when run through the pasta machine. Yes, PVClay crumbles instantly. But I found that unlike dried-out clay, it transforms and becomes workable within minutes. After some squeezing and flattening, PVClay will soon hold together enough to run through the pasta machine and it conditions smoothly and with a very nice texture. I found that it worked best to go ahead and crumble it into a Ziploc bag and then squeeze the bag a few times to get the clay to hold together. Using a mallet would work nicely! There was no need to add any clay softener. Every color I tried had the same texture, behavior, and lovely smooth texture once it was fully conditioned. PVClay might start crumbly, but after conditioning the texture is soft, smooth, and has a nice balance between being floppy and firm. It IS a bit sticky, though, and it sticks to itself readily. It takes fine texture well. Though, if fingerprints are an issue for you, you might want to wear gloves. Colors mix nicely and easily and PVClay mixes nicely with other brands of polymer clay. An interesting point about PVClay is that it has a fairly strong fragrance that really reminds me of baby powder. It’s quite pleasant and not irritating. Edinho tells me that no fragrance is added and it’s part of the materials, but it sure does smell like something was added. PVClay comes in 42 colors which include colors, pastels, pearl, neutrals, skin colors, metallics, fluorescent, and a translucent. The colors are bright, true, and well saturated. There seems to only be one primary yellow in the line of clay, but there are two primary reds (Kitana Red is cool and Scarlet Red is warm) and two primary blues (Ultramarine blue is cool and Royal blue is warm). I feel confident that you can create any color, shade, or tint that you want with this brand of clay. I received the primary colors Ultramarine Blue, Lily Yellow, and Kitana Red. I mixed them using my Graduated Colors process to show the color wheel. As you can see here, the secondary colors are not muddy. In the color triangle above, each color consists of a larger baked circle of clay and on top of it a smaller circle of raw clay. I did this to show if there is a color shift between raw and baked clay. Alas, it’s not terribly clear in the picture, but there is some darkening in the purple area. But at least for these primary colors, there is not a significant darkening and color change with baking. I can’t speak for all the colors, though. PVClay comes in gold, silver, and copper metallic clay and in blue, green, red, and white pearl. Yes, pearl colors!! I tried the gold metallic and the blue pearl and found them to behave just the same as the other colors. Here they are showing off the mica shift technique. The pearl seemed to have a less dramatic mica shift that than gold, but that could be due to the fact that it’s darker by nature. As you would expect, PVClay makes nice mokume gane effects. The layers of clay stick together extremely well and there is no delamination. It takes the impression of a stamp well and forms a clear design. By the way, this clay does not get gummy when you use water as a mold release. I did, however, find it difficult to make slices from the mokume gane stack. Perhaps because the clay crumbles easily, it does tend to fracture and come apart a bit as you slice the blade across the stack. The action of the blade itself seemed to break off bits of clay under the blade, causing a dragging or smearing effect. Sometimes the action of the blade would pull bits out of the design below the blade. You can see this in the picture above of the gold mica shift. That’s what happened to create those specks at 7, 8, and 11 o’clock in the picture. I don’t consider this to be a deal-breaker. It’s just something you have to learn to work around. This is a wonderful polymer clay to cane with! It’s firm, it’s easy to shape the cane components the way you’d like, and the sections stick together nicely. I don’t see this clay coming apart as you reduce the cane (I’ve had Kato do that). But you do have to be careful, though, as once this clay sticks it itself – it’s stuck! You can’t peel apart the pieces and reposition them like you can do with Kato, so plan ahead. I had no trouble reducing the cane, there wasn’t a lot of extra waste at the cane ends, and the design reduced without distortion. As you can see in the cane, the design is clean and crisp, without smearing. The cane sliced neatly and I was very pleased with it until I was processing the pictures and saw it up close, far closer than my eyes could possibly see. If you look super, super close you can see that the “breaking apart” issues I saw with mokume gane. This isn’t really visible in practice, but if you’re looking for a super, super crisp and precise cane this clay might not be the one for you. But for us mere mortals, it’s a great caning clay. As I’ve said many times before, I’m not a sculptor. It takes a totally different set of skills than I have to make little figurines. But I wanted to test this clay so I used a tutorial by Kater’s Acres to create this little owl. First off…sculpting is hard. Just putting that out there. But this clay is up to the challenge. It does take fingerprints easily, so use tools and wear gloves. But the clay itself sculpts easily, smooths nicely, and holds its shape. I find this clay to be droopier than Kato or Premo, in general, but this was not a problem when forming this owl. The pieces stayed where I put them and didn’t sag. One particularly nice thing is that the “stickiness” of this clay means that as you add pieces to your sculpture they stick tight and they don’t fall off. If you are a sculptor, PVClay also comes in a doll-making and sculpture line. Edinho tells me that it’s softer than the Decor line of colors and is similar to Super Sculpey but is stronger. It comes in 1 lb (456 g) blocks in white, gray, and a range of flesh colors. Just like with Fimo Professional, PVClay bakes at 265°F (130°C) for 30 minutes, depending on the thickness. I find that baked PVClay has a slight sheen. The texture is very similar to other brands of polymer clay. In fact, it very much resembles Premo in feel when baked. PVClay is slightly transparent when baked and light does transmit through thin pieces. This is true even for the colors. This is not a chalky colored clay like Sculpey III or Souffle. The dark colors, in fact, are almost like a dark-colored clear clay rather than a highly pigmented chalky clay. I did a little test to see how strong beads of clay were. I made 1/2″ (13 mm) beads of PVClay, Premo, and Fimo Professional and baked them for an hour. I drilled a hole in each of them with a hand drill (pin vise). All three clays were quite hard and drilling was not super easy like with Souffle. PVClay is certainly comparable to Premo or Fimo Pro in this. Balls of PVClay (burgundy), Fimo Professional (red), and Premo (yellow) that were hit repeatedly with a hammer trying to smash them. Next I whacked each bead with a hammer trying to shatter the bead. Well, that didn’t happen. You can see marks on the beads where the hammer hit them, but the beads did not break, crack, chip, or crumble in any way. The burgundy one above is PVClay. Notice the marks on it from being hit with a hammer. This is strong clay. I also baked thin strips of these same three clays to check flexibility and tear strength. All three are very flexible when baked, at least at this thickness. And I find that the above mica shift and mokume gane samples are identical in “bendiness” as similar pieces I have in my collection that are made from Premo. This clay is not stiff and hard like Kato and is not brittle like Sculpey III. When I folded this strip of PVClay, it did not break. Even when I creased it, it didn’t break but a white line did appear. (This same white line did not appear on the Fimo Professional.) I tried bending several other colors of baked PVClay and it does seem that the white line is typical when it’s bent or distressed. Then I tried to tear the strips in two. I could not tear the strip of Fimo Professional with my hands. The Premo tore and snapped pretty easily. But the PVClay didn’t pull apart until I started to twist it and pull hard. So it’s stronger than Premo but not quite as strong as Fimo Professional. Thin strips of Premo, Fimo Professional, and PVClay (top to bottom) that have been torn with bare hands. Premo tore easily, Fimo not at all, and PVClay after some effort. The major pro to PVClay is that it’s a full range of very nice polymer clay AND it’s available in South America. There is a growing number of polymer artists and crafters there and it’s sometimes quite difficult to find sources of the more popular brands of polyclay such as Fimo and Kato. The availability of PVClay brings wonderful choice to these artists. The key is getting the word out there so they know it exists! PVClay is has an excellent range of colors including a translucent, metallics, and pearl colors. The clay is good for caning, mica shift, sculpting, and really, all general clay work. I didn’t find anything that it’s truly unsuitable for. PVClay is also very strong and flexible and if you’re used to brittle clays like Sculpey III, you’ll be very pleased with this clay. The only cons about this clay, in my opinion, have to do with the packaging. I didn’t like having to wipe dust off the ends of the bars. And once you’ve used part of a bar, it slides out of the paper sleeve easily and that means the color information is no longer kept with the clay. I store mine in Ziploc sandwich bags, but I don’t like putting the paper sleeve in there with the clay. Some people might consider the crumbly nature of the clay to be an issue, but since it conditioned nicely with little work, it didn’t bother me much. PVClay can certainly hold its head high on equal ground with the big name polymer clay brands. This is a very nice product and any artist should be happy to work with it. PVClay appeared in one of those coincidences of life when I called Beatriz Cominatto, an artist that works with polymer clay since 1992, trying to get her book “Making Art with Plastic Ceramic”. We had never spoken before, but soon we began to discuss having polymer clay manufactured in Brazil. Beatriz, one of the forerunners of the art in Brazil, was quite unhappy with the availability of polymer clay in Brazil and wished to no longer depend on expensive and scarce imported products. Also she wanted a local Brazilian product with good quality. I had knowledge of the raw materials and shared my interest and willingness to help develop the product. It was born through that phone call in early 2005, a promising professional partnership that remains firm and strong today. It took some years of research and testing, many samples, reviews of some important artists who also tested the product, until we reach the ideal product. I, Edinho Juliotti, am the manufacturer, and the brand has Beatriz Cominatto’s signature. She endorses and guarantees the product quality. PVClay is sold through the online store (www.pvclay.com.br) and also by teachers / dealers located in some Brazilian States. Shipping to other countries is fulfilled through the Brazilian Post Office, directly to the purchaser. If you’re outside of Brazil and run into any difficulties in placing an order, feel free to contact the company through their contact form. The link is at the bottom of their website. If you’re eager to learn more about polymer clay in Brazil, there is a Portuguese language Facebook group called Polymer Clay RJ Duo ateliê. Thank you to Edinho Juliotti and PVClay for the samples of PVClay and for the information in researching this article. This sounds like a pretty decent clay. Thank you for doing the research for all of us, once again! Thanks for the shout out too. You made a really good owl! It’s a very nice clay. And I need to do more sculpting. I need some practice. When I compared my little owl to your Parker, I was disappointed in my amateur efforts. But then you’ve been doing this a long time, too!! Thank you very much about your evaluation. I know the Brand trough Facebook but I didn’t have the opportunity to use it. It’s probably that the shipping cost from Brasil to Buenos Aires be cheaper than from US or Europe. I Heard than sometime we had our own (Argentinian) Brand of polymer clay in 70’s or 80’s but it failed because the market didn’t developed. The product is virtually unknown yet in Argentina. Now, we can purchase in (only a few) artistic shops only Fimo because there is a Staedtler local distributor, but the price is very high because the rate between the dólar/euro and argentinian pesos is very negative to us. I hope this Brand will find soon a local distributor and it be available in our artistics shops with a competitive price range. Well the only way to find out about the shipping cost is to ask. 🙂 You never know. And perhaps with more conversations about it, maybe more distributors can be found. Perhaps ask your local art shops about ordering some PVClay? You just never know, right? You are right Ginger. Because of this your evaluation is so important, because it minimize the possibilities to choose wrong and waste our money. Now, I know more about the quality of the product from a neutral person with no personal o commercial interest in promote one or other brand. I found this very useful. Ah good, thank you. I do try to be neutral. If I truly don’t like a product I typically don’t actually say bad things about it. I typically would just not write about it. Thanks for a wonderful review, as usual, Ginger. When you have time, I would like to know how the trans compares with Premo and the others. I did have a chance to do a little bit, but not a comprehensive test. It’s quite white, not pinky brown colored like the Premo trans. It does have fluorescent dye in it, too. But it’s not super clear like Pardo. It’s pretty comparable in clearness to Fimo Effect. In fact, it’s a very similar clay. Thanks, Ginger. Was hoping it would be clearer than that, but that’s ok.
Ginger…how do you manage to do such wonderful comprehensive reviews for us! Thanks so much for your contributions. You are a peach. My mother always calls me Ginger Peach, oddly enough. Angela, you always sound like you’re having so much fun with this. I’m so glad my ramblings on these things are helpful for you. And I’m glad you found Kato. Being in the hot lands of down under, it’s a really great clay because it doesn’t get too soft. Nice write up, always interested in new clays. Love the thought that it smells like baby powder ! Is it still possible to browse the website in English. I can’t seem to find the option to change the language to English on the top of the page. I do need to mention that I am on an iphone and not on a computer. I don’t see the option either. I don’t have any connection to the folks at PVClay, however. I just reviewed their clay. You might want to contact them directly. They do speak English. You made a good observation. My question is what a softener can I use to condition the PVClay? 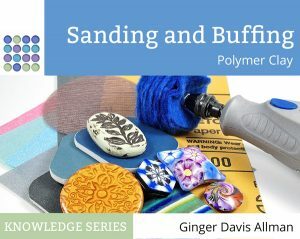 You can use the same softener you use with any brand of clay, such as any liquid clay or one of the clay softeners such as Sculpey Clay Softener, Fimo Mix Quick, Sculpey Mold Maker, or Cernit Magic Mix. One point of note, PVClay tends to be very crumbly when you first start conditioning it. That doesn’t mean it needs additives. Keep working with it and it will usually soften up and become workable.